Last updated on: October 29, 2018. 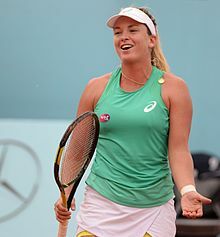 Colleen "CoCo" Vandeweghe (/ˈvændəweɪ/ VAN-də-way) (born Colleen Mullarkey December 6, 1991) is an American professional tennis player. A former Junior US Open champion at the age of 16, she has also won two WTA titles, both at the Rosmalen Grass Court Championships in Den Bosch. In 2017, she reached two Grand Slam semifinals and the final of the WTA Elite Trophy to move up to a career-high ranking of No. 9. In addition to her two Grand Slam semifinals in 2017 at the Australian Open and the US Open, Vandeweghe has twice reached the quarterfinals at Wimbledon, in 2015 and 2017. Despite being predominantly a singles player, she also excels at doubles. In 2016, she partnered with Martina Hingis in much of the second half of the season and reached the semifinals of the US Open, a performance that lifted her to a then-career-high ranking of No. 18 in the world. In that year, she also reached two Grand Slam mixed-doubles finals, at the Australian Open and at the US Open. In 2018, Vandeweghe won her first Grand Slam title; partnering Ashleigh Barty she won the women's doubles title at the US Open. Later on, they reached the semifinals at the 2018 WTA Finals, lifting Vandeweghe to a new career-high ranking of No. 14. Vandeweghe's prowess at both singles and doubles helped her win all eight of her Fed Cup rubbers in 2017 across three different ties to lead the U.S. team to its first Fed Cup championship since 2000. Vandeweghe was born to 1976 Olympic swimmer Tauna Vandeweghe and her then husband Robert Mullarkey. Coco's maternal grandparents are 1952 Miss America Colleen Kay Hutchins and former New York Knicks basketball player Ernie Vandeweghe. Her uncle, her mother's brother, is basketball player Kiki VanDeWeghe, and her grandmother's brother was NBA player Mel Hutchins. Coco first started playing tennis with her elder brother, Beau, at the age of eleven. Tennis was the last sport she chose in her early life, after trying among other things basketball and wrestling. Vandeweghe eventually turned pro in April 2008. Self-described as a "total California girl", she spends most of her off-season at the beach with her family. She is good friends with fellow American players Madison Keys, Irina Falconi and Shelby Rogers. Vandeweghe is known to have one of the strongest serves on the tour. In 2014, she hit 306 aces, third highest on the tour. She plays very aggressively, and likes to take the ball early and on the rise on both sides. Her groundstrokes are heavy and are delivered flat and powerful. Vandeweghe is efficient at the net and enjoys moving forward to avoid extended rallies. Because of her consistent serve, she has a solid mental game. Overall fitness and movement are cited as her weaknesses. Her favorite shot is her forehand down the line, and her preferred surfaces are hard and grass courts. Previously, she was coached by Robert Van't Hof in Newport Beach, California and Adam Peterson on the road. She is currently coached by Pat Cash. As a junior, Vandeweghe was coached by Guy Fritz, the father of Taylor Fritz. In 2008, she reached the singles final of the USTA Girls 18s national championship as the 3rd-seed, losing to top-seeded Gail Brodsky. She also won the doubles event with Jamie Hampton, defeating the top-seeded pair of Brodsky and Mallory Cecil in the final. With these results, she earned wildcards into the main draws of the singles and doubles events at the US Open. In general, Vandeweghe did not play many junior events and needed a wildcard to enter the 2008 US Open girls' singles tournament. Nonetheless, she would go on to win the tournament without dropping a set. Vandeweghe moved up to the ITF circuit after the event and this would end up being her last junior tournament. With the victory, she rose to a career best junior ranking of No. 15 in the world. Vandeweghe made her WTA debut at the 2006 Acura Classic at the age of 14, losing in the first round to Kateryna Bondarenko. The following year, she played there again as a wildcard and again lost in the first round. In 2008, Vandeweghe played in her first Premier tournament at Miami, where she lost to Sabine Lisicki in the first round. At the US Open where she would go on to win the girls' singles title, she made her debut in the main draw of a Grand Slam with the wildcard she received from reaching the finals of the USTA junior national championship. She would lose to second-seeded and eventual runner-up Jelena Janković in the first round. In 2009, Vandeweghe obtained an invitation from the Hong Kong Tennis Patrons' Association to play the JB Group Classic exhibition tournament with compatriot Venus Williams and Argentine Gisela Dulko in January. The trio would win the tournament, with Vandeweghe partnering with Williams to win their doubles match in the final. In March, she was granted a wildcard to play at Miami, but lost in the first round. In Vandeweghe's second WTA tournament of the year, she recorded her first WTA Tour level win at the LA Women's Tennis Championships, defeating world No. 58 Tathiana Garbin in the first round. In 2010, Vandeweghe received a wildcard to the Australian Open, but she lost in the first round. In the spring, Vandeweghe won two back-to-back ITF tournaments at Carson and El Paso to see here WTA ranking climb from outside the top 300 to inside the top 200. At the Mercury Insurance Open in San Diego in August, Vandeweghe made her first deep run at a WTA tournament, beating Gisela Dulko and then Vera Zvonareva for her first top-10 victory. Despite high expectations at the US Open, Vandeweghe lost in the first round to Sabine Lisicki. Vandeweghe finished the year strong by qualifying for the Toray Pan Pacific Open in Tokyo, a Premier 5 tournament. She would then defeat world No. 18 Aravane Rezai and eventually make the quarterfinals before losing to Victoria Azarenka. In 2011, Vandeweghe came through the qualifying rounds at the Australian Open, but was knocked out in the first round. Her first big result of the year came at the Memphis Indoor Tennis Championships, where she reached the quarterfinals to break into the WTA top 100 for the first time in her career. Towards the end of the season, Vandeweghe won first career match in the main draw of a Grand Slam tournament at the US Open, defeating world No. 56 Alberta Brianti in the first round. 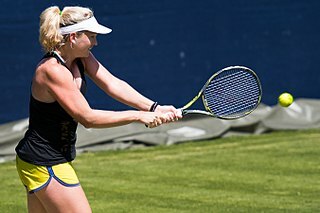 Vandeweghe got off to a slow start in the 2012 season, but started to gain some momentum in the grass-court season when she reached the final of the $75K event at Nottingham. She followed this up by qualifying for Wimbledon, but she ended up losing the first round. At her next tournament, Vandeweghe entered the main draw of Bank of the West Classic at Stanford as a lucky loser and made it all the way to her first career WTA final. In the semifinal, she upset fifth seeded Yanina Wickmayer before falling to top-seeded Serena Williams in straight sets. She was the first lucky loser to reach a final since Melinda Czink in early 2005 and also rose to a then career-high ranking of No. 69 in the world. Vandeweghe's best result in the rest of the year was a quarterfinal at the Citi Open. In 2013, Vandeweghe began the season with another slow start. When her ranking fell outside the top 200, she began to rebound by reaching the quarterfinals at the Bank of the West Classic. Later in the season, Vandeweghe was able to qualify for the US Open and beat another qualifier in the first round to lift her ranking back closer to the top 100. Vandeweghe commenced her 2014 season at the ASB Classic, where she was the top seed in the qualifying rounds. She beat Valeria Solovyeva and Irena Pavlovic in straight sets before losing to Kristýna Plíšková in three sets. Her next tournament was the Australian Open where she was seeded second in qualifying, but lost to Anastasia Rodionova in straight sets. Given a wildcard into the BNP Paribas Open, Vandeweghe earned her first WTA singles win of the year, beating Alexandra Cadanțu 6–4, 6–0 before losing to eighth seed Petra Kvitová 1–6, 3–6. Her next event was in Miami, where she qualified for the main draw with two set wins over Alison Van Uytvanck and Sharon Fichman. There she beat Marina Erakovic, Anastasia Pavlyuchenkova, Samantha Stosur before losing to eventual champion Serena Williams in the fourth round. With a strong showing in Miami, she reached a career-high ranking of No. 82. Next she participated at the Monterrey Open before losing to Caroline Wozniacki in two close sets. At the French Open, Vandeweghe won her first-round match for the first time in Paris, beating Iveta Benešová in straight sets before losing to Ekaterina Makarova in the second round. Vandeweghe had a very impressive grass-court season. At the Aegon Classic in Birmingham, she beat Zarina Diyas and Yanina Wickmayer before losing to Klára Koukalová in three very close sets, despite serving 18 aces. At the Topshelf Open, Vandeweghe won her first WTA singles title. Seeded second in qualifying, she beat Nicole Melichar and Kristina Mladenovic. In the main draw, she beat Marina Erakovic, Vania King, Garbiñe Muguruza, Klára Koukalová in the semifinals and Zheng Jie in the final. During that impressive week, she hit a total of 81 aces and rose to a career-high ranking of No. 51. In Wimbledon a few days later, she beat Muguruza again in three sets, extending her winning streak to eight matches won. She lost to Tereza Smitková in the second round. Her next event was the Bank of the West Classic in Stanford, where she made the final in 2012 as a lucky loser. She made the second round with a comfortable win against fellow American Kristie Ahn before losing to third seed Angelique Kerber. Vandeweghe went on to reach her first quarterfinal at a Premier-5 event at the Rogers Cup. She easily qualified for the main draw, dropping just five games in the qualifying rounds. In the first round she beat Timea Bacsinszky 6–1, 6–2. She drew Ana Ivanovic in the second round where she won in three tight sets. She then went on to beat Jelena Janković in three sets in the third round, before losing to Ekaterina Makarova in the quarterfinals in three sets. After Montréal, her ranking rose to No. 38 and entered the top 40 for the first time in her career. In Connecticut Open, she lost in straight sets to Camila Giorgi. At the US Open, she made the second round for the third time. She beat Donna Vekić 2–6, 6–3, 6–1 but lost in straight sets to Carla Suárez Navarro. After the US Open, Vandeweghe's next tournament was Toray Pan Pacific Open. She beat Alla Kudryavtseva in the first round before losing to Dominika Cibulková in two close sets. She made the second round of Wuhan, first round of Beijing and second round of Osaka to end her best season to date. She ended 2014 ranked No. 39. Vandeweghe achieved her best Grand Slam result at Australian Open, where she made the third round for the first time after victories over Francesca Schiavone and Samantha Stosur, falling to Madison Brengle. In 2015, just three days before the French Open, Vandeweghe and coach Maciej Synowka parted ways, having worked with each other for over a year. Vandeweghe is now coached by Craig Kardon, who has previously worked with star players like Martina Navratilova, Lindsay Davenport, Jennifer Capriati, and Ana Ivanovic. She upgraded her best Grand Slam result at Wimbledon, where she made the quarterfinals after victories over Anna Karolína Schmiedlová, 11th seeded Karolína Plíšková, 22nd seeded Samantha Stosur, and sixth seeded Lucie Šafářová before falling in three sets to fourth seeded Maria Sharapova. She made her first Grand Slam semifinals in doubles with Anna-Lena Grönefeld at the US Open. Vandeweghe got off to a rough start in 2016. She commenced her season at the ASB Classic where she was the seventh seed but lost to her compatriot and good friend Irina Falconi in the first round 7–5, 4–6, 3–6, despite being up a break in the final set. An alternate for Sydney, Vandeweghe lost in the first round to Jelena Jankovic 3–6, 4–6. She then travelled to Melbourne to compete at the 2016 Australian Open, where she drew her countrywoman Madison Brengle in the first round, again losing 3–6, 4–6. However, Vandeweghe enjoyed some success in women's doubles, where she and her partner, Anna-Lena Grönefeld, reached the quarterfinals and losing to world number ones Sania Mirza and Martina Hingis in three sets. Vandeweghe teamed up with Romania's Horia Tecău in the mixed doubles event where they made the final, falling just short to Elena Vesnina and Bruno Soares. After the Australian Open, Vandeweghe participated at Dubai Duty Free Tennis Championships, where she scored her first win of 2016, knocking out the sixth seed Karolína Plíšková. She went on to reach the quarterfinals of Dubai, with another strong win over Kristina Mladenovic, before losing to Elina Svitolina in three sets. At the Qatar Total Open, Vandeweghe made it to the third round, with straight set wins over Kirsten Flipkens and Belinda Bencic, obtaining her first top-ten victory of 2016. In March, Vandeweghe made the third round at Indian Wells, beating Kiki Bertens and Svetlana Kuznetsova before losing to Jelena Jankovic for the second time in 2016. In doubles, Vandeweghe teamed up with fellow American Bethanie Mattek-Sands, where they unprecedentedly claimed the doubles title. En route to the title, they beat Dabrowski/Martínez Sánchez, the second seeds Chan/Chan, the eighth seeds Spears/Atawo, the third seeds Babos/Shvedova in the semifinals, and Görges/Plíšková in the final. It was Vandeweghe's first doubles title. After Indian Wells, Vandeweghe participated at the Miami Open, where she also reached the third round after defeating Samantha Crawford and world No. 6 Carla Suárez Navarro before losing to Monica Niculescu in straight sets. Vandeweghe travelled to Brisbane, where she represented U.S. at Fed Cup. Her decisive win over Samantha Stosur meant that the U.S. team will return to World Group stages in 2017. After Fed Cup, Vandeweghe lost in the first rounds of Madrid and Rome. At the French Open, she won her first clay court match of the season, beating Naomi Broady in three sets. In her round two match, she faced Irina-Camelia Begu where she lost in 3 hours and 37 minutes despite serving for the match. In mixed doubles, Vandeweghe paired up with Bob Bryan. They reached the quarterfinals, where they lost to French duo Kristina Mladenovic and Pierre-Hugues Herbert. Vandeweghe found form in the grass-court season. She won her second WTA title at the Ricoh Open. She beat Indy de Vroome, Nao Hibino, Evgeniya Rodina, Madison Brengle and finally Kristina Mladenovic, 7–5, 7–5, to win the title. It was her second title overall, and second title at Rosmalen Grass Court Championships, having won the tournament in 2014. She then played at the Aegon Classic, where she beat world No. 3 and top seed Agnieszka Radwańska, Christina McHale and Yanina Wickmayer, before losing to Barbora Strýcová and thus ending her eight match winning streak. After this tournament, her ranking rose to a career high of No. 30. At the Wimbledon Championships, Vandeweghe was seeded at a Grand Slam tournament for the first time as No. 27. She made the second week for the second straight year. She beat Bondarenko, Babos and sixth seeded Vinci before losing to eventual quarterfinalist and 21st seed Anastasia Pavlyuchenkova in the fourth round. Her win over Vinci was her fourth top-ten victory in 2016. Vandeweghe struggled for the remainder of the 2016 season, registering just two more wins; over Nicole Gibbs in Stanford at the Bank of the West Classic, where she was the fourth seed, and over Sara Errani in Cincinnati. At the Australian Open, Vandeweghe easily defeated 15th seed Roberta Vinci in the first round 6–1, 7–6(7–3). After cruising through her match against Pauline Parmentier, Vandeweghe battled to defeat 2014 Wimbledon finalist Eugenie Bouchard in three tight sets. In the fourth round, she pulled off the biggest upset of the tournament as she defeated defending champion and world No. 1 Angelique Kerber in straight sets. This victory, her first against a No. 1 player, advanced Vandeweghe to her first quarterfinal at the Australian Open and only her second quarterfinal at a Grand Slam tournament, the first being at Wimbledon in 2015. She then defeated seventh seed Garbine Muguruza in straight sets to advance to her first ever semifinal of a Grand Slam where she went head-to-head with the 2003 finalist Venus Williams. Despite winning the first set in a tiebreak and delivering a brilliant performance, Vandeweghe was defeated by Williams 7–6(7–3), 2–6, 3–6, who spoke brightly of Vandeweghe following the match. Vandeweghe also became the fourth North American woman other than the Williams sisters to make the semifinals at an Australian Open in a five-year span, following Sloane Stephens (2013), Bouchard (2014) and Madison Keys (2015). Following the tournament, Vandeweghe rose into the top 20 for the first time in her career. Seeded 19th at the French Open, she lost in the first round to Magdaléna Rybáriková. At the Wimbledon Championships, Vandeweghe was seeded 24th. She beat Mona Barthel in straight sets in the first round, then continued with straight-set victories over Tatjana Maria and American compatriot Alison Riske. She then defeated fifth seed Caroline Wozniacki in the fourth round, advancing to the quarterfinals for the second time in three years. She was defeated by Rybáriková in the quarterfinals in straight sets, the second straight Major she was beaten by the Slovak. At the Stanford Classic, Vandeweghe reached the final for the third time where she lost to fellow American Madison Keys. Seeded 20th at the US Open, Vandeweghe recovered from a set down to beat compatriot Alison Riske in the first round then conquered Ons Jabeur for her first victory on Arthur Ashe stadium and to advance to the third round of the US Open for the first time in her career. She then defeated tenth seed Agnieszka Radwanska in three tight sets followed by a victory over 2015 French Open finalist Lucie Safarova to reach her third Grand Slam quarterfinal of the year, where she stunned top seed and world No. 1, Karolina Pliskova in straight sets to advance to her second major semifinal, where she was defeated by Keys, thus being denied of the chance to reach her first Grand Slam final. Following the tournament, Vandeweghe rose to a career-high ranking of No. 16. She concluded the season by reaching the final of the Elite Trophy in Zhuhai. This result helped her break into the top 10 for the first time, ending the season as No. 10. At the Australian Open, Vandeweghe was eliminated in the first round by the Hungarian Timea Babos. During the match, she was warned for delaying the start of the second set while she demanded that a banana be delivered to the court. Towards the end of the match, she was penalised a point for shouting expletives at her opponent. She was later fined $10,000. The incident generated controversy in the press and on social media with tennis fans calling Vandeweghe's actions on court "disgusting." Vandeweghe's on-court behavior has been criticized in the past. Shortly after Vandeweghe revealed, that she during the Australian Open had suffered from a bad virus, and was ordrerd by her doctor to limit her travel, due to recovery. That meant a withdrawn from Qatar Open in Doha. Vandeweghe returned to WTA at the BNP Paribas Open in Indian Wells, and was eliminated in the single draw. At Miami Open, Vandeweghe lost her 1.st round match in the Singles Draw, but she entered the Double with Ashleigh Barty for the first time. The pair won their first double title together, with notable wins over 4-th seeded Timea Babos / Kristina Mladenovic (HUN / FRA) in 1.st round, 1.st seeded Ekaterina Makarova / Elena Vesnina (RUS / RUS) in the Semi Final and 2.nd seeded Barbora Krejcikova / Katerina Siniakova (CZE / CZE) in the Final. At the clay season, Vandeweghe reached the Final at the Porsche Tennis Grand Prix, where she lost to Karolina Pliskova. Early elimination in Madrid Open and Italian Open followed, and in French Open she reached 2.nd round. The grass tournaments before Wimbledon showed the same results in the clay season. Vandeweghe reached the Semi Finals in s'Hertogenbosch, before she lost to the eventual champion Aleksandra Krunic. An early defeat in Nottingham to Petra Martic followed and at Wimbledon, Vandeweghe was defeated by Katerina Siniakova in 3.sets, but worse was that she injured her right ankle during the match. The injury meant, that Vandeweghe and Barty had to withdrawn from the Ladies Double, and she was sidelined during the US Open Summer Series. Vandeweghe made comeback at the Western & Southern in Cincinnati, and had another defeat. To get more matches before US Open, Vandeweghe received a wildcard for the Connecticut Open. She met Rybarikova in first round, and was forced to withdrawn from the match in 3.rd set, with pain in her injured ankle. At the US Open, Vandeweghe was defeated in the Singles Draw by Kirsten Flipkens. But the US Open became a turnpoint for Vandeweghe, when she and Ashleigh Barty made a big surprise by winning their 1.st Grand Slam title in the Ladies Doubles. The pair had on their way to the final won their matches in two sets, including notable wins over 3.seeded Andrea Sestini Hlavackova / Barbora Strycova (CZE / CZE) in 3.rd round, and 1.st seeded Barbora Krejcikova / Katerina Siniakova (CZE / CZE). In the Final 2.nd seeded Timea Babos (HUN) / Kristina Mladenovic (FRA) was downed with a win on 3-6 7-6(2) 7-6(6). Vandeweghe and Barty held 3 Championships Point in 3.rd set, before they converted it on a doublefault from the serve of Mladenovic. At the beginning of 2019, Vandeweghe was forced to withdraw from several tournaments including Australian Open due to injury. Shortly after, she published a video on her social profile accounts, that she had undergone surgery in her right ankle. The ankle injury had plagued her since Wimbledon 2018. Vandeweghe has played in the World TeamTennis pro league for seven seasons. She was a wildcard player for the Philadelphia Freedoms in 2016, after appearing as a roster player for them in 2015. Vandeweghe previously played for the Sacramento Capitals in 2009 and 2012, the Boston Lobsters in 2010 and 2011, and the Orange County Breakers in 2013. Vandeweghe represented the United States at the 2017 Hopman Cup and Fed Cup. She won all eight matches she played in the Fed Cup as the U.S. team won the tournament. Current through the 2018 China Open (tennis). ^ "CoCo Vandeweghe Pronunciation – The Name Engine". The Name Engine. Retrieved January 24, 2017. ^ a b "Babys turning pro – what's up with that?". Montreal Gazette. September 11, 2008. Retrieved July 13, 2017. ^ Waldstein, David. Coco Vandeweghe, Kiki's niece, wins U.S. Open girls' title. NJ.com (September 7, 2008). Retrieved on September 7, 2011. ^ "2014 WTA Tour statistics" (PDF). WTA Tour. Retrieved January 22, 2017. ^ "2008 USTA NATIONAL CHAMPIONSHIPS-GIRLS 18s Day 8". College and Junior Tennis. Retrieved November 13, 2017. ^ a b "Profile at itftennis.com". Retrieved April 9, 2009. ^ "Coco Vandeweghe Matches". WTA. Retrieved November 13, 2017. ^ "Serena Williams to face Coco Vandeweghe in Stanford final". bbc.co.uk. July 15, 2012. Retrieved July 15, 2012. ^ "Serena Williams tops Coco Vandeweghe for Stanford title – ESPN". Espn.go.com. July 16, 2012. Retrieved October 3, 2012. ^ "Serena Williams wins at Stanford in final Olympic tuneup". timesofindia.indiatimes.com. July 16, 2012. ^ "Kerber no match for hot CoCo". ausopen.com. January 22, 2017. ^ "CoCo goes bananas in shock loss to Babos". ESPN. January 15, 2018. Retrieved January 24, 2018. ^ "CoCo Vandeweghe fined $10,000 for foul-mouthed outburst at Australian Open". news.com.au. January 19, 2018. Retrieved January 24, 2018. ^ "Coco Vandeweghe blasted for calling opponent 'f---ing b---h". Sydney Morning Herald. January 16, 2018. Retrieved January 23, 2018. ^ "Andy Murray, Coco Vandeweghe show bad behavior not just confined to Nick Kyrgios". The Daily Telegraph. September 8, 2015. Retrieved January 23, 2018. ^ "How US Tennis Players Have Given the Sport a Bad Rap". Bleacher Report. September 19, 2011. Retrieved January 23, 2018. 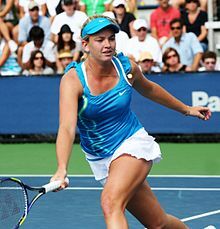 Wikimedia Commons has media related to CoCo Vandeweghe.